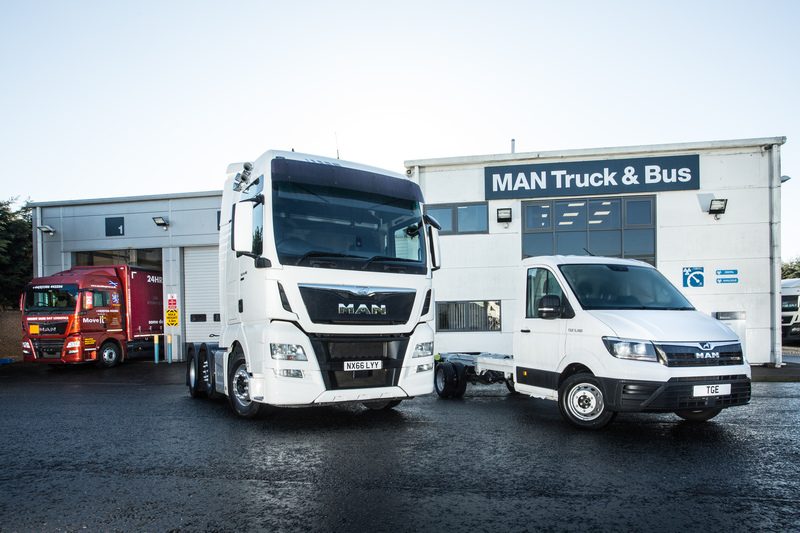 MAN Truck & Bus is one Europe’s leading Commercial Vehicle manufacturers and with the introduction of the TGE van, at the 2017 Commercial Vehicle Show, MAN has expanded its product portfolio and is now an established full-range supplier covering all weight categories. Vans from 3.0 to 5.5 tonnes, Trucks from 7.5 to 44 tonnes and Heavy Haulage vehicles with a gross train weights of up to 250 tonnes. The 2019 Commercial Vehicle Show will see MAN Truck & Bus UK showcase a range of vehicles, from the 5 tonne TGE Minibus and the 3.5 tonne TGE flatframe chassis cowl, through to the 6x2 TGX XLION Flagship tractor and a TGX 41.640 8x4/4 BBS Heavy Haulage prime mover. Supported by bespoke customer tailored and integrated business focused aftersales products, including a full range of Finance options, MAN Trucks and Vans set benchmark for the highest levels of efficiency, reliability and cost-effectiveness. MAN Truck & Bus product messages. The New XLION equipment packages are available across the MAN truck range with versions for long-haul, construction and distribution vehicles. The XLION exhibited at the Commercial Vehicle Show has been specified to ensure that operators benefit from added value and drivers can rest easy in the comfort of their MAN vehicles. With optional XLION livery the Commercial Vehicle show TGX 26.500 6x2/2 BLS XLION Tractor unit is powered by the MAN D26 12.4 litre, 6 cylinder engine capable of producing 500 hp (368 kW) and 2500 Nm. This powerful, tractable and efficient engine is married to the MAN Tipmatic® 12 speed automated Transmission. Sitting above the three axle chassis is the MAN XLX High roof sleeper cab which affords drivers a true home from home, lap of luxury working and living environment. MAN is delighted that the XLION is making its UK premier at the 2019 Commercial Vehicle Show. The 2019 Commercial Vehicle Show witnesses the unveiling of the New MAN TGE Flatframe chassis cowl chassis. Sitting a full 190 mm lower than the standard frame TGE chassis cab and specially designed with ease of use and bespoke body build in mind, the walk-through nature of the chassis cowl cab design makes this vehicle the ideal base for conversion into low height luton and box bodies, campervan or motorhome. Powered by the efficient and reliable 140 hp (103 kW) 2.0 litre 4 cylinder turbo diesel engine, capable of producing 340 Nm, the Commercial Vehicle Show TGE flatframe chassis cowl is based on the 4490 mm wheelbase variant, it uses a 6-speed manual gearbox and is front wheel drive. The 2019 Commercial Vehicle Show exhibit has the standard track rear axle; a wide track version follows later in the year. We have a number of exciting Alternative Fuelled stories to share surrounding vehicles across the entire MAN range and we are working on our Commercial Vehicle Show exhibit. More details to follow. Please see the information below relating to the MAN Commercial Vehicle Show Press Briefing – April 30th – between 08.00 and 08.25 in the Piazza Suites, directly adjacent to the entrance to both Halls 4 and 5. The New MAN D1556 engine, as a standalone exhibit, makes its UK debut at the 2019 Commercial Vehicle Show. The D1556, newly added in 2019, offers many advantages, one of these being its weight saving attributes, it is an impressive 230 kg lighter than its predecessor the D20. The New D1556 engine, found in the TGS and TGX ranges, is a direct replacement for the outgoing MAN D20 engine. Marking yet another unveil at the 2019 Commercial Vehicle Show, the MAN TGE enters the passenger carrying sector in the UK with the arrival of the New TGE 17-seater Minibus. Converted in the UK, by Minibus Options, to meet the exacting needs of the individual operator, the TGE Minibus exhibit is configured to seat 17, 1 driver plus 16 seater passengers, 10 seated passengers plus two wheelchair users or 14 seated passengers plus one wheelchair user. Powered by a tractable, efficient and reliable 180 hp (134 kW) 2.0 litre 4 cylinder bi-turbo diesel engine, capable of producing 410 Nm, the Commercial Vehicle Show TGE Minibus is based on the 4490 mm wheelbase variant with extended overhang, it uses a 6-speed manual gearbox and is rear wheel drive. As a leading manufacturer of commercial vehicles, ranging from 3.0 to 250 tonnes, MAN is extremely proud of its heavy haulage heritage and expertise. The 2019 Commercial Vehicle Show Heavy Haulage tractor exhibit is a MAN 41.640 8x4/4 BBS which is powered by the range topping MAN D38, 15.2 litre, 6 cylinder, 640 hp engine, capable of delivering 3000 Nm from 900 rpm. Featuring the range topping XXL High Roof sleeper cab and the much acclaimed MAN Tipmatic® 12 speed with converter and retarder transmission, the 41.640 8x4/4 BBS Commercial Vehicle exhibit feature’s Hub Reduction drive axles and a 3.5” pin fifth wheel. Individually designed and built to suit both the heavy haulage and abnormal load sector, whilst meeting individual customer operational needs, MAN Heavy Haulage tractors receive a personalised touch from start of production to customer delivery. Once they arrive in the UK a dedicated team of experts both handover the vehicle and look after it throughout its life. 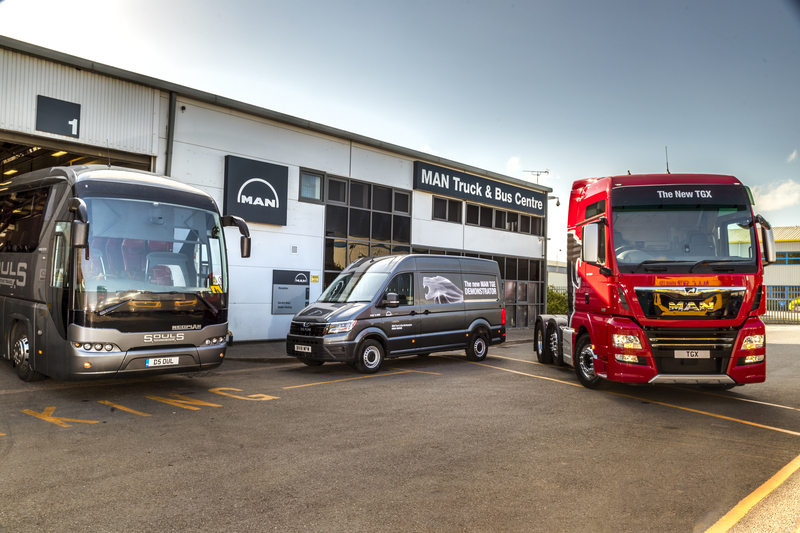 Announced in 2018 MAN Truck & Bus UK Ltd has committed to invest a total of £20 million over the next five years in its wholly owned dealerships. This substantial investment, which will include a number of current location expansion re-openings, new greenfield and brownfield developments, will both increase the number of points of representation and further enhance MAN’s customer centric approach. MAN is committed to delivering the highest levels of both customer service and support and in addition to the £20 million, a number of franchised dealer partners are also investing in new sites and re-openings. MAN is once again holding its Commercial Vehicle Show Press Briefing. This year the briefing will be held prior to the show opening on the first day, Tuesday 30th April, between 08.00 and 08.25 in the Piazza Suites, rooms 2/3/4, directly adja-cent to the entrance to both Halls 4 and 5. This event will allow you to mingle with colleagues and talk with the MAN Board members, across all business areas, prior to the show opening. Thomas Hemmerich, Managing Director MAN Truck & Bus UK Ltd, will deliver a short presentation outlining our Commercial Vehicle Show highlights and will update you on our most current business achievements.